It was on January 12, 1942 that bus operator Roy Corrigan was provided with a desk in what was then the premises of Reo Motors in William Street, Sydney and he was handed a list of 50 names of people to be contacted. Roy’s brief was to get the newly formed NSW Omnibus Proprietors’ Association up and running. He had just been appointed Association Secretary. Six years previously, Roy had established a service car and taxi operation between Berowra and Berowra Waters; he later acquired the Hornsby-Galston-Arcadia bus service. For the ten years prior to that January day in 1942 the interests of private bus operators had been catered for by the Feeder Bus Owner’s Association. But membership had begun to decline due to the difficulties being experienced by operators as World War II tightened its grip. It was decided to revitalize the association, change its name from the Feeder Bus Owners Association to the NSW Omnibus Proprietors’ Association and expand its membership throughout the State. The State was to be divided into districts, with branches at Newcastle, Gosford, Katoomba and Wollongong. Metropolitan branches were to be established at Parramatta, Liverpool, Hurstville and North Sydney. Later other branches were to be formed at Lismore, Grafton, Broken Hill, Wagga Wagga, Cowra and Nowra. Brian LeQuesne was elected president, and Roy Corrigan was chosen to look after the administrative side. NSW Bus Proprietors Association outside the original premises of Challis House Martin Place. 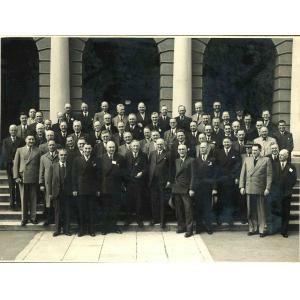 Roy Corrigan ( first secretary ) and Brian Le Quense ( first president ) are in the front row centre. Undated but early 1940’s. Soon after it was formed one of the first actions taken by the NSW Omnibus Proprietors’ Association was the registration of the association as an industrial union of employers in the State Arbitration Court. One of the main functions over the years has been dealing with matters in the industrial field. As the nation settled into the post war period the NSWOPA found itself involved in not only industrial matters but in court proceedings opposing the infiltration by the then Department of Government Transport services over routes operated by members. An early campaign was for the abolition of conductors and the introduction of one man buses. Over 50 cases of prosecutions for not providing conductors were defended by the association on behalf of members before the regulations were changed. The Government funded school bus system was negotiated for Country NSW in 1966. From this point on membership of the Association increased as Country Operators became aware of the Association and the benefit of belonging to an Association that, represented their interests. Roy Corrigan retired as Secretary in 1969 and he was replaced by George Gourley. George had served with the Motor Omnibus Division of the NSW Department of Road Transport and Tramways prior to World War 11. After the war George gained experience as a Bus Operator with Kogarah Bus Company and in the 1960s with Doug Barnes at Barnes Bus Lines, Panther Bus Lines and Parlorcars in Melbourne. On his return to Sydney in 1968 George Gourley was appointed Assistant to Roy Corrigan. Late in 1968, the Association’s office moved from Challis House, Martin Place in Sydney to 323 Church Street, Parramatta. Throughout 1968 George Gourley spearheaded the drive to set up Association Branches throughout Country NSW. Many a country branch meeting took place in a school bus prior to school coming out in the afternoon. In 1970, the name of the Association was changed to that of the Bus Proprietor’s Association (NSW). In 1971 we organised our first BPA Bus Show, it was a one day event held at Fairfield showground. 1972 was a landmark year for our Association; we acquired our present premises at 27 Villiers Street, North Parramatta and the first Executive Meeting to be held at 27 Villiers Street was under the Chairmanship of President Jim Newport on 18 January 1973. The Association has actively promoted the Private Bus Industry of NSW since 1942 and has represented the industry at all government inquiries including the Curlewis Inquiry 1973; the Russell Report 1983 and the Public Accounts Committee Inquiry 1992. In 1979 the BPA (NSW) became a Foundation Member of the Australian Bus and Coach Association and has assumed the secretariat responsibilities of ABCA, (now BIC – Bus Industry Confederation). The Association again changed its name on 26 August 1980 to the Bus and Coach Association (NSW) to more adequately indicate the scope of its activities and elevated the position of General Secretary to that of Executive Director. George Gourley retired from the Association in 1981 and was succeeded by Andrew Burston, Colin Fryer, Neville Gazzard, David Meidling, Alan Cooper, Barrie Macdonald, the incumbant since 1999 is Darryl Mellish. Subsequent to George Gourley’s death in 1990, BCA (NSW) named the Association’s premises “Gourley House” as a tribute to his work and dedication to our industry. The Association is a strong and willing association that is more than prepared to meet its obligations and to promote the private bus industry. The strength and willingness to work flows from the structure of the Association – the Executive are all practicing bus operators and all decisions are made by busmen. The growth of the Association can be directly attributed to the stature of its Presidents. Each and every President has had more than their share of industry problems to sort out. Our Association has been in the vanguard of change from the early days of fighting to protect their services from the infiltration of Government buses to initiating changes in legislation such as the removal of conductors from buses to many, many negotiations on award variations in the NSW Industrial Commission to the negotiations with Government on concession fares, bus specifications and the School Student Transport Scheme. Perhaps the greatest task of all throughout the years, was the challenge of the Passenger Transport Act 1990. Here is an Act of Parliament that recognised the Private Bus Industry; an Act that replaced the Transport Act 1930 which was proclaimed in order to take private buses off the road. The Bus and Coach Association (NSW) has earnt it stripes over the years and is in a strong and healthy position to face the challenges of the 21st Century.